In the previous article we explained how it is possible to customize calendar events by changing opacity settings and animation speed highlighting an active event. 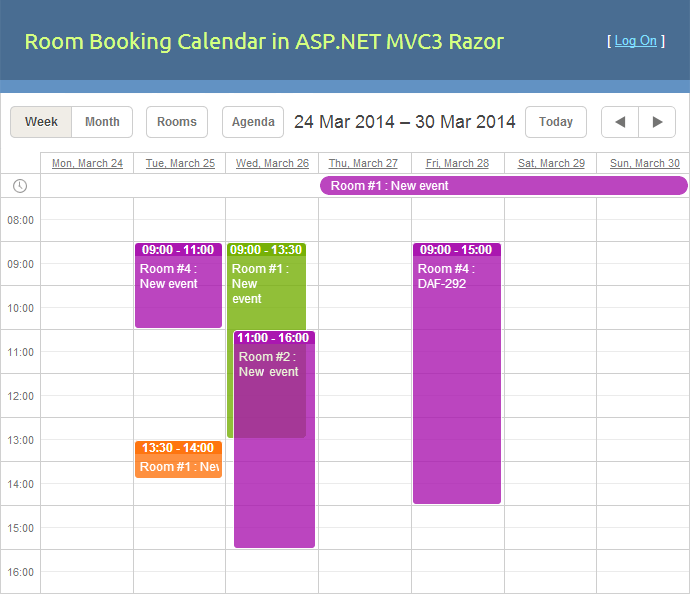 We've applied the described changes to the booking calendar demo created in ASP.NET MVC3 Razor. Here is a step-by-step description of what have been done to get transparent events, enable dynamic loading, and other useful changes. 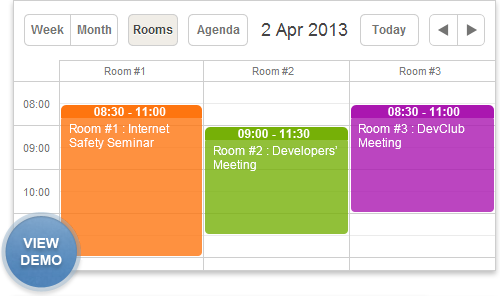 (Note: the full code to create a booking calendar is provided in the Room Booking Tutorial). In the previous tutorial we've placed quite a lot of code on the .cshtml page, since it's kind of an intuitive way. However, it's not considered to be a good practice, firstly because it increases the size of your page. JS and CSS put on the page is never get cached, so it's better to store a static code and styles in separate files to help browser open your page faster. Secondly, and mainly, it mixes up html markup and the logic of the application, that could complicate maintaining of the app in the future. In this article we are going to fix it. As you may remember, the code has used some data retrieved from the server side - the list of rooms, the id of the current user, and the boolean flag showing whether the user is logged in. To make the calendar look more light and 'airy', we are going to configure a bit the events. In the previous tutorial we displayed events in different color for each user. Now we'll add opacity settings to the event boxes. To make it more interactive and visually react on user actions - opacity will be changed to a solid color when user hovers mouse over an event box. Firstly, update configuration of DHXScheduler, so it would request data in 'dynamic' mode - requesting only the data required for currently viewed time. Secondly, update data handler in order to give data in parts (note that scheduler sends boundaries of displayed area, we need to load only events that happen within that period). Since data loading may still take time, it might be a good idea to display some animation that will show user that loading is in progress. The default .gif is a bit old-fashioned, you can replace it with any custom .gif (see /Content/ajax-loader.gif in the sample package for the example). Feel free to comment below and share the room booking tutorial with your friends.